Looking for a way to incorporate luxury into every aspect of your bathroom design? With Moen's Caldwell bathroom suite, you can introduce classic styling into your bathroom with beautiful fixtures designed with aesthetic appeal and environmental consciousness in mind. The defining characteristics of the Caldwell collection include gentle curves and rich details, paired with the latest in aerator technology designed with water conservation in mind. Whereas traditional aerators push 2.2 gallons per minute (gpm), the aerator used in the Caldwell suite is optimized to utilize only 1.5 gpm, resulting in a significant water savings. Caldwell faucets have earned the Environmental Protection Agency's (EPA) WaterSense certification. There is sure to be a Caldwell bathroom sink fixture that is perfect for your bathroom design. You can choose a chrome finish in the two handle style with a low arc spout. If you prefer a brushed nickel finish, you can select the two handle high arc model. For a completely coordinated bathroom design, you can choose coordinated chrome or brushed nickel tub and shower faucets. Caldwell's bath options feature single handle faucets with large shower heads designed to produce a wide spray pattern for the ultimate shower experience. The Caldwell Suite includes Moen’s lifetime limited warranty to ensure superior quality. 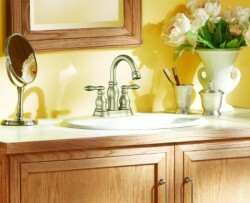 For more information about Moen's Caldwell bathroom collection, see www.moen.com or visit your local Lowe's retail store.